View an Excerpt from Chapter 4: "Standard Score and Deviation Score"
Think you can't have fun learning statistics? Think again. The Manga Guide to Statistics will teach you everything you need to know about this essential discipline, while entertaining you at the same time. With its unique combination of Japanese-style comics called manga and serious educational content, the EduManga format is already a hit in Japan. In The Manga Guide to Statistics, our heroine Rui is determined to learn about statistics to impress the dreamy Mr. Igarashi and begs her father for a tutor. Soon she's spending her Saturdays with geeky, bespectacled Mr. Yamamoto, who patiently teaches her all about the fundamentals of statistics: topics like data categorization, averages, graphing, and standard deviation. After all her studying, Rui is confident in her knowledge of statistics, including complex concepts like probability, coefficients of correlation, hypothesis tests, and tests of independence. But is it enough to impress her dream guy? Or maybe there's someone better, right in front of her? Reluctant statistics students of all ages will enjoy learning along with Rui in this charming, easy-to-read guide, which uses real-world examples like teen magazine quizzes, bowling games, test scores, and ramen noodle prices. Examples, exercises, and answer keys help you follow along and check your work. An appendix showing how to perform statistics calculations in Microsoft Excel makes it easy to put Rui's lessons into practice. This EduManga book is a translation from a bestselling series in Japan, co-published with Ohmsha, Ltd. of Tokyo, Japan. Shin Takahashi graduated from the Graduate School of Design at Kyushu University in Japan. He has worked as a lecturer and performing data analyst and is currently employed as a technical writer. Takahashi has published several books in the Japanese Manga Guide series, including Statistics-Factor Analysis Edition and Statistics-Regression Analysis Edition (both published by Ohmsha). Want to try the examples in the book in a different format? Loathe Microsoft Excel? Download a reader-contributed R version of the exercises. "This is really what a good math text should be like. Unlike the majority of books on subjects like statistics, it doesn't just present the material as a dry series of pointless-seeming formulas. It presents statistics as something fun, and something enlightening. It shows you why you should care about this material, and how it's useful even to people in non-mathematical fields." "If you want to introduce a subject that kids wouldn't normally be very interested in, give it an amusing storyline and wrap it in cartoons." "The art is charming and the humor engaging. Readers will enjoy following Rui as she struggles with math concepts while showing off her new school uniform and realizing her romantic feelings for her tutor." "Provides accurate, clearly related statistical content as the underlying schoolgirl-crush story line unfolds. . . Recommended." "The Manga Guide to Statistics is filled with great examples, twists, humor and memorable characters while still being able to stay on topic. It is definitely way better than trying to comprehend a bland statistics book." "Every example, both in the cartoon and at the end of the chapter, uses real-life examples that would be of interest to the average teenager and, thus, makes the text more relevant." "It's both authentic, straight-from-Japan manga and a valuable book of learning, which seems almost redundant to me, since I've already learned so many important things from manga over the years." "For those who've been taking math classes in high school or college, I think this book will be very helpful in making statistics easier to understand." "This book is an excellent introductory book on statistics. The material is well organized around the fundamental, basic concepts you would expect to find in a book that serves as an introduction to the field of statistics." "I've already had a couple of instances where I've recommended The Manga Guide to Statistics to a co-worker or friend who was boggled by statistics. I'll probably continue to recommend it when I run into similar situations." "All I remember about statistics from my teen years is that it was much harder than I thought it would be. It's a shame they didn't have fun books like The Manga Guide to Statistics back then. This book is fun and entertaining, yet instructional and educational." "If you know when you need, for example, a histogram, then this book will help you remember how to make one." "I think that the real strength of The Manga Guide to Statistics may be in helping younger people to find the entry into this kind of work to be more entertaining. Kids would be, I think, much more likely to actually pick this up and find out if they are interested in statistics as opposed to a regular text book." "Inoue's art is clean, cute and simplified, and it works with machine-like efficiency—the artist not only knows and speaks the language of manga, but does so fluently, which makes this a better effort than some of the other, more cynical attempts to use a hot, new publishing craze to try and get kids interested in some form of education, be it classic literature or test-taking." "For students who have difficulty with math or statistics, this may be a good introduction, making the lessons more interesting and fun than using a standard textbook." "Where The Manga Guide to Statistics really shines is in its presentation of its intended learning material." "This manga succeeds in presenting important statistical concepts in an accessible and entertaining way. The charm of the book lies in the real-world examples it uses: magazine surveys, ramen noodle prices and bowling scores all make an appearance here." "The art is nicely clean and filled with just the right amount of detail, and the characters are quite expressive and given to funny asides. I laughed every time Rui made a scared face at a complicated equation." "This book covers the basics of statistics, and starts in on the more challenging topic of probability discussions. If you need a math refresher, this is enjoyable." 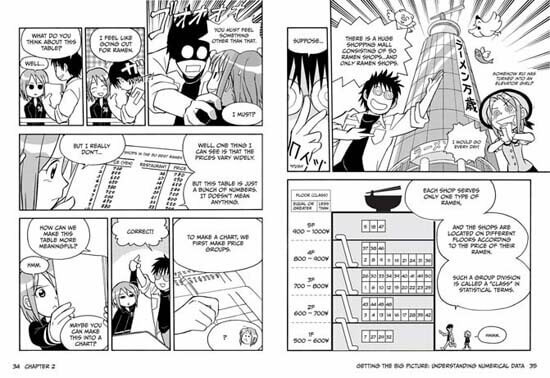 "Besides taking a chill-pill from the traditional way of describing dull statistical information, The Manga Guide to Statistics offers a visualization of statistics that can't be found in any mere textbook. In the illustrated format, Rui and Mr. Yamamoto provide a backdrop to the mathematical lessons with an overall plot capable of being called a shojo." "If you are looking for an easy to understand and quality introduction that includes a bit of frivolity, you will find this book both useful and enjoyable. I did." "Since the level is elementary and the examples simple, the complete hand calculation is shown, something that I would love to see in all advanced-level texts!" "The Manga Guide to Statistics is a great introduction for anyone who wants to learn statistics."